A handwritten letter in Arabic. Confirm age of Tanious son of Jirjis (16). Written by Father Khouri Boutrus Kafinany on June 22, 1913. An immigration record for Faride Fahajoun issued on November 15, 1913, and stamped by the Georges Bousquet in Marseille, France. It is a pink tag from the S.S. Germania of the Fabre Line. 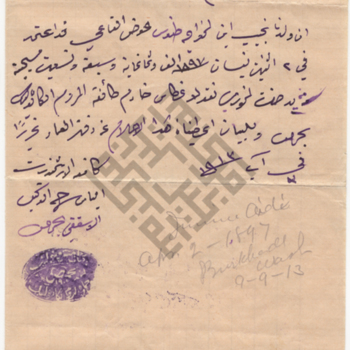 An Arabic letter handwritten by Father Khouri Francis Basile on August 30, 1913. It confirms the birthdate of Adele Abdullah Aqel alBistany on January 20, 1896, putting their age at 17 years and 7 months. A note from Nellie M. Choate of Arlington Mills written on November 8, 1913 certifying that Adio Nassar is a "Syrian illiterate minor." It states that he left Arlington Mills on July 31, 1913 and he could not write his name. A school record for Adio Nassar, created on November 8, 1913, certifying his age as 17 and residence as 363 Elm St. It lists his employer as Arlington Mills.